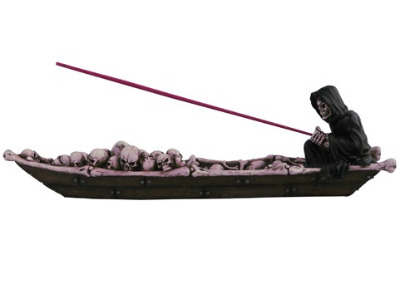 Resin reaper sitting in a boat of skulls and bones. Incense stick sits in the reaper's hands imitating a fishing rod. The boat acts as an ash catcher. Approx 30 cm long, this incense holder comes boxed and packed in polysytrene. View our full range of Incense Burners here.